The unfortunate reality for most entrepreneurs with an idea is that money is often a prerequisite. And, often, this need necessitates outside sources. However, for the lucky minority, outside funding may not be necessary – either because the idea is not capital intensive or because of the ability to self-start. Despite the wide array of funding sources, there are three general categories: Bootstrapping, Debt, and Equity. In recent years, crowdfunding on platforms such as Fundable have become a powerful source of funding for both bootstrapping and equity techniques. Big checks from investors may grab headlines and be an ideal solution for your funding needs, but they make up an extremely small portion of annual funding: less than 14% in 2012. So how do most businesses find startup funding? 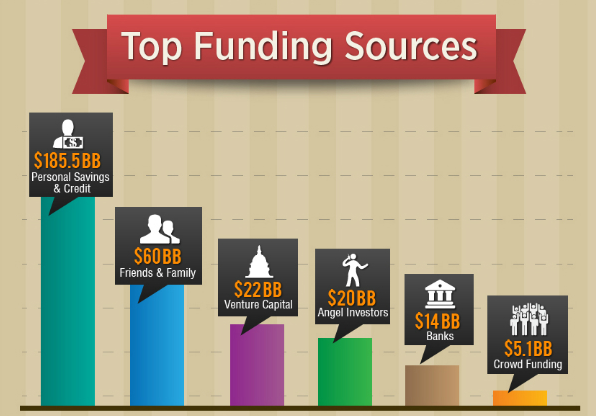 Check out our infographic on where startup funding really comes from by clicking below. It would be ideal for startup founders to be able to begin their venture with a lump of investor capital. Unfortunately for most startup founders, that isn’t realistic. For centuries, the majority of entrepreneurs have funded their businesses with their own capital through bootstrapping. Bootstrapping often entails using personal savings, credit cards, promising stock for sweat equity, or borrowing from friends and family. Borrowing from friends and family can be difficult to ask for, and even more difficult to orchestrate. However, many entrepreneurs have turned to crowdfunding on sites like Fundable to streamline the friends and family round. Startup funding generated from bootstrapping will often cover the essentials of a business, such as incorporating, basic office supplies, or maybe a website domain. Several would-be costs, such as marketing and promotional dollars, can be alleviated by the founders’ sweat equity and hard work. The longer the business can sustain itself and grow via bootstrapping, the better: GoPro is a good example. If the entrepreneur doesn’t have much capital to put in, the next best thing is a mountain of market research, data compiled from talking to potential customers, and getting everything in place to be successful once capital is available. The less work that has been done to move the business forward, the harder it will be to find interested outside capital. Having a good idea is not enough – in almost all cases, an entrepreneur should expect to invest their own time and money before they can get anyone else to put theirs in as well. Investors will want to see that the founder has skin in the game, and therefore a vested interest to motivate progress. Due to the relative rarity of receiving a chunk of capital from an investor (less than 1% of startups in 2012 were written a check by a venture capitalist) bootstrapping is nearly a given for most startups – simply due to the speed of access. Bootstrapping also allows the entrepreneur to focus on getting the validation and traction necessary to be attractive for equity investment later in the game. There are certainly examples of companies receiving funding simply from an idea with little or no validation or traction. These examples are the exception and not the rule – and are often the result of being led by individuals with a track record of success. Simply put, debt is capital you have to pay back. Generally, debt is easier to come by in terms of funding your startup, as there are far more lenders in the world than equity investors. Lenders are also more open to funding smaller cap lifestyle businesses (think restaurants and other family businesses). Because lenders are more indiscriminate in the industries they lend in (investors often favor industries such as technology or healthcare), a traditional loan is one of the most frequent and viable roads to funding. Loans are often useful and accessible when there is a clear means to service the debt put into place. Take a restaurant for example. Some essential materials, including stoves and grills, can cost thousands of dollars to purchase and install. If a loan were taken out to fund these costs, and the grills purchased allowed for the restaurant to begin cooking and selling product, debt makes sense. On the flipside, borrowing for non-recoverable expenses such as salaries or rent does not make sense. Unless there is a clear path for the borrowed money to be converted into revenue with which to repay the loan, debt should not be incurred, or some serious problems will likely follow. Savvy entrepreneurs can take advantage of programs such as the U.S. Government-backed Small Business Association (SBA) loan program. Though these are government supported, the financial institution may still require substantial planning and resources to support writing the loan. Due to the unappealing sound of “going into debt” and being tied to a loan, entrepreneurs often try and avoid looking at debt options. These options are not as scary and complicated as they sound, and are often a very good route for startup funding. Equity refers to capital a startup founder receives in exchange for stock in his or her company. As we previously discussed, equity options are far more rare than bootstrapping or debt options. However, entrepreneurs are often attracted to equity deals because they are not based on his or her personal credit or collateral, nor do they have to be immediately paid back in the form of installments. Equity investments are most valuable in businesses that involve high risk and normally a longer period for return on investment. Companies that require quite a bit of runway (the amount of time before they begin generating significant income) look to equity, as they cannot afford making regular debt payments before generating revenue. In addition, having the ability to leverage an investor’s network and experience can be extremely beneficial to the startup. The downside to equity is a big one: giving up ownership (and sometimes control) in your company. Giving another individual stake in your company ties you to that investor for the life of the company. It is very unlikely to recover equity in your company once you part with it, and this can create challenges for the founder(s). Despite the potential challenges for the founders, entrepreneurs still beat down the doors of equity investors. The sheer volume of new startups – around 6 million new businesses are incorporated each year – drives the low percentage of founders who receive venture capital each year. With only around 3-4,000 deals done annually, it is simple supply and demand. 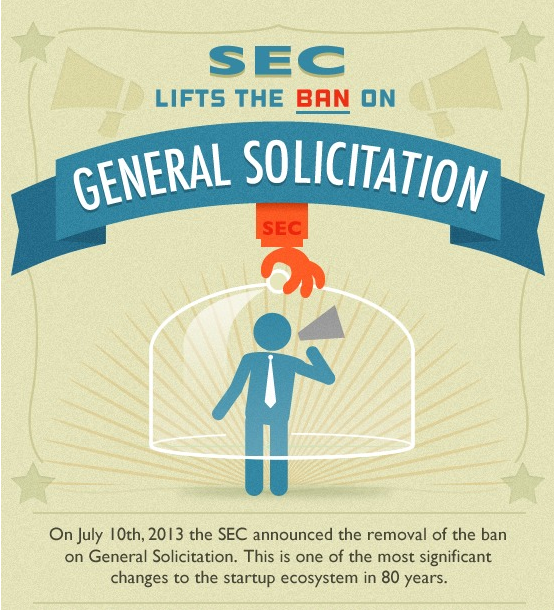 Very recently following the passage of the JOBS Act, the SEC lifted the ban on general solicitation for equity investment via crowdfunding platforms such as Fundable. This increases the opportunities for entrepreneurs to reach investors and improve their chance at funding through equity crowdfunds, and paved the way for an estimated $5 billion of investment in 2013. Funding for startups is available in all sorts of forms, and an entrepreneur would be wise to consider and evaluate all forms of capital available for each stage of the business. As the company grows and evolves, different forms of capital will make more sense and be available for that stage – moving from simple credit card debt and personal savings to more complicated sources like angel investors and commercial loans. In general, if equity is available, most entrepreneurs jump at the opportunity. However, it isn’t available to most entrepreneurs, and wasting a lot of time trying to attract investment at the wrong stage of your business will hurt in the long run. Bootstrapping and investigating debt options are often a founder’s best bet initially – even if the thought of going into debt sounds scary and complicated. When entering the funding landscape and trying to wrap your head around everything, be patient. Startup funding is a critical component to your business venture and is a big issue to tackle. Even experienced entrepreneurs haven’t dealt with all the different types of capital in their careers. The key is understanding the different options available, and then very deliberately evaluating your options. In the next chapter, we provide startup advice from successful and noteworthy entrepreneurs.